Luke’s entry into the dance world began in the 1990’s with West African dance and drumming as part of Blue Mountains based percussion group “Hands, Heart & Feet”. His association with CDT began when he joined the GOLD troupe at it’s inception in 2011; and this continues to be an important part of his dance world. 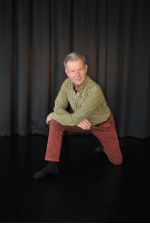 More recently Luke has been an enthusiastic supporter of contemporary dance, classical ballet and contact impro. In co-teaching the CDTeens with Amy Macris, his objective is to make dance more accessible to diverse groups in the wider community. This is done by developing dance skills and performance opportunities in an energetic and enjoyable group environment.